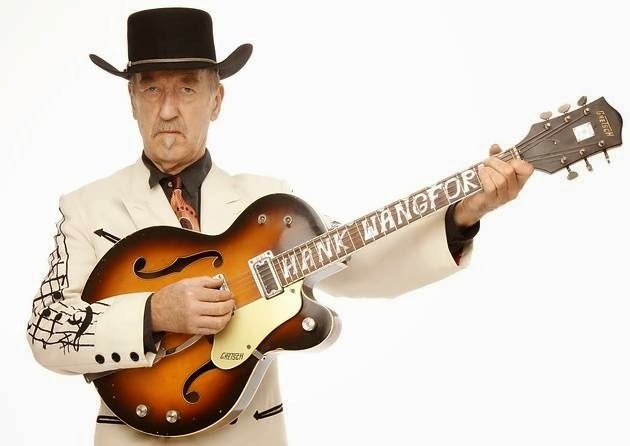 Hank Wangford has been a long established cult figure on the UK country music circuit for many decades and now into his 74th year he still continues to entertain folks up and down the land with a show that succeeds in grasping the reality of the genre. The shows are billed as discovering the dark underbelly of country and through tales, songs, recollections and insight, Hank truly achieves his objective leaving the audience splendidly entertained in the midst. He may be a confirmed urbanite but Hank has spent many years taking his shows around the rural village halls that are sprinkled liberally across these isles. For this evening, he is in more familiar territory or at least in a city environment but the intimacy of the Kitchen Garden Café fits his ideals perfectly of total connectivity with a like-minded audience. The sold out café enthusiasts were more of a Ray Price country persuasion than Blake Shelton and this suits Hank well as there is a defined traditional stance to the theme of his sermons. Any stereotypical view of a UK based traditional country act is blown away after two hours in the company of Hank Wangford. The originality to his cliché-free act is a refreshing experience as both humour and acute observations are interspersed with a mix of self-written and carefully selected cover songs. In the presence of his sidekick, Brad Breath aka the very talented multi guitarist Andy Roberts, Hank has found the perfect foil to lead the audience on a journey filled with divorce, pain, loss, cheating, drinking and all other aspects of misery that have been the bedrock of country music for eternity. Yet all this is done in a style of delivery which is unique, thought provoking and totally absorbing. There were several inspirational covers during the evening which struck at the heart of Hank’s discovery objectives including Webb Pierce’s ‘There Stands the Glass’, Louvin Brothers' ‘Must You Throw Dirt In My Face’, ‘Brown to Blue’ by George Jones and Willie Nelson’s ‘Half a Man’. Throughout his multi -dimensional career as both artist and rock n’ roll doctor to the stars of the sixties such as Gram Parsons and The Who, Hank has gathered an armful of tales and this evening was appropriate to share some of his encounters with Willie Nelson. While he has arguably not been the most prolific recording artist, Hank was still mightily proud of his latest release, a record inspired by his love of waltzes, containing waltzes and aptly titled SAVE ME THE WALTZ. Amongst the popular songs during the evening, many requiring little invitation to joining in the chorus, ‘Lonely Together’, ‘Simple Pleasures’ and the ‘Ballad of Bill Picket’ were the most enjoyable. The latter containing the story of a unique rodeo star denied the trappings of Hollywood stardom due to the non-white ethnicity of his origin. Having seen Hank perform a number of years ago at Americana International, this was a first opportunity to witness one of his full live shows and whatever your country persuasion is, spending an evening at one of his gigs is an experience not to be missed. Did we discover the dark underbelly of country? I definitely think so, but as there is still plenty left in Hank’s tank, why not embark on the journey yourself.